Full-back Hayden White is backing Peterborough United to bounce back to form when League One promotion fancies Millwall visit the ABAX Stadium on Tuesday (August 16). Posh slipped to their first defeat of the season yesterday (August 13) when Bradford City won 1-0 at the ABAX. 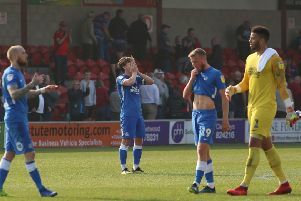 Posh manager Grant McCann admitted his side performed poorly, but White insists there will be no hangover for the visit of the Lions, a side who lost in the play-off final last season. White said: “Our heads won’t drop. It’s just one defeat early in the season. It’s not nice losing at any stage of a season, but there is plenty of time to put things right. “What we must do is start games better, especially against the good sides like Bradford and Millwall, and I’m sure we will. “The manager wants a strong home record this season as it’s vital for teams who want promotion. White, McCann’s first signing in the summer, has kept Northern Ireland international right-back Michael Smith out of the Posh starting line-up so far this season. “I’ve loved every minute of my time at the club,” White added. “Obviously it helps being in the side and I am playing for a manager who gives me the freedom to do what I want.